The Pro-Style Sinnerbait is made with 60 strand skirts and premium Mustad hooks. Comes standard with #5 and #3 double willowleaf blades. Different blades are avaiable upon request. Great minnow shaped head with 3-d eyes. 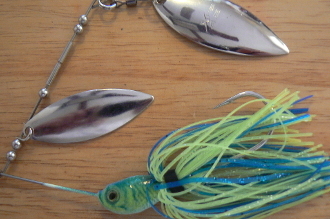 A great fish catching spinnerbait!